Legendary Open is the first amateur golf tournament exclusively for members, where you will have a week full of competitions at HARD ROCK HOTEL & CASINO PUNTA CANA. 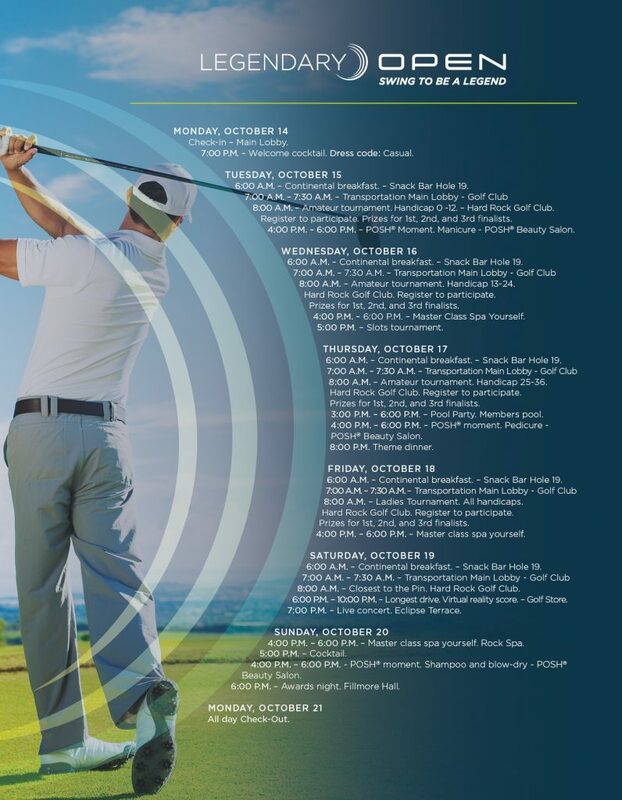 OCTOBER 15th TO 20th, 2019 We invite you to enjoy an exclusive week of golf introducing three tournaments by handicap and an exclusive tournament for the Ladies. Get your skills to the fullest in the contest CLOSEST TO THE PIN and the virtual LONGEST DRIVE. The first places will win prizes, but without a doubt the best prize will be to participate in this fun experience. FREE TWILIGHT GOLF ROUNDS From October 15th to 20th, 2019 get one free twilight round at golf club, first come first serve . 60 rounds available per day, from 14:00 hours. ENJOY FULL In addition to the golf experiences we will present welcome cocktail, awards party, spa-yourself master class, beauty clinics, exclusive cover concert and more. Enjoy this fun experience only by booking this week, contact the call center today and request the different promotions we have for you to attend the event.